...what is your system for carrying your bikes on the back of your truck? We knew that we wanted to bring our bikes with us on this adventure, though we are not die-hard mountain bikers we do enjoy a good bike ride, whether around a park or to the store, and figured we would also use them periodically to check out campsites. We also knew that we didn’t want to attach our bikes to the back of the trailer on a bike rack, but instead we wanted them on the truck so that we could have them with us when we left our site to do some exploring. We have had rolling tonneau covers on several of our previous pickups and have always liked them. We went down to our local truck accessory store to discuss our options and how we wanted to carry our bikes and they showed us the Pace Edwards rolling tonneau covers that we were familiar with, but they introduced us to the Explorer Rails. These rails sit on top of the edge of the pickup bed and house not only the tracks for the tonneau cover but also have slots down the middle which allow you to mount either Thule or Yakima crossbars. The tonneau cover we chose is a Pace Edwards Full Metal Jack Rabbit which is a step up from the Jack Rabbit version. It has aluminum panels with a black ‘rhino like’ covering that roll up into a box that hangs down from the bed rails. The box does take up some room in the bed of the pickup but because it rolls flush with the top of the bed it allows the crossbars to sit over the bed at a fairly low profile. Our crossbars are made by Thule but Yakima also makes bars and stands that fit the Explorer Rails. Our bike racks are also made by Thule. They are the Thule Side Arm and they mount to the cross bars. The arm that holds the bikes solid at the front wheel/fork locks in place. There is a cover over two of the fasteners that bolt the rack to the cross bar. This cover also locks to make it more difficult for someone to easily remove the racks from the crossbars. The rack holds the bikes sturdily and we’ve never had any issues with them moving around, even on bumpy roads. 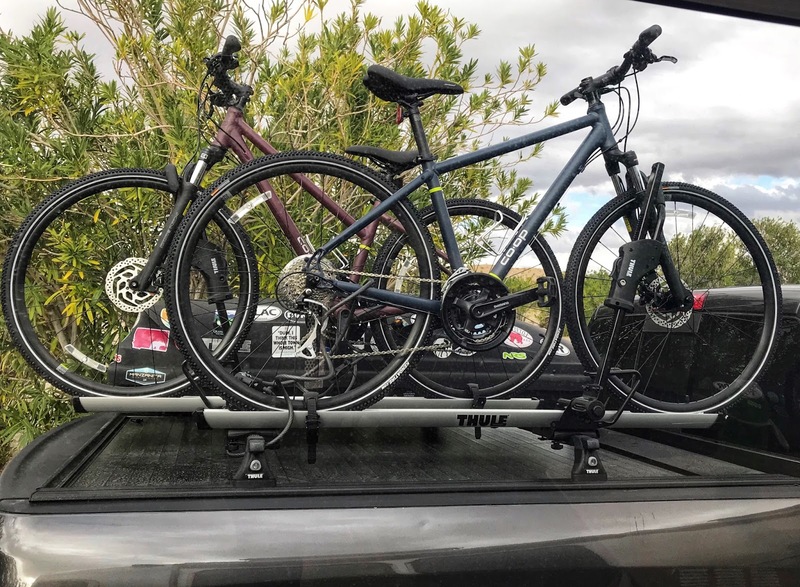 The bikes and car top carrier make it a little more challenging to access the full length of the bed of the truck, but we can roll the tonneau cover back completely and still reach everything in the back of the bed without removing the bikes or the car top carrier. If we want to completely rearrange everything and clean out the bed of the pickup we remove the bikes to make it easier. This system isn't theft proof, apparently...! We had our bikes stolen off the back of the pickup in Las Vegas while we were away visiting family. We left the truck parked in a semi-secure lot (it was actually at the Airstream dealership) for a few weeks...which was about two weeks too long as thieves decided to jump the fence and take them. The bikes were cabled to the crossbars but the thieves cut the cable and then hack-sawed the rack arms to get the bikes. We can’t really do anything about preventing someone from using a hack saw but we now added a chain to our setup, if we expect to be away from them for a longer period of time. This setup works really well for us! Let us know (email us, find us on Facebook or Instagram) if you have any questions or suggestions! Hi guys! We got it at a truck accessory store!